Innovation is not a term that often come to mind when considering acoustic instruments. This notion is proved wrong more and more each year with our collection of Breedlove guitars for sale. With their graduated top and bridge truss system, Breedlove has created a durable line of products with tone that rivals established favorites for over 25 years. Their Passport line offers the Breedlove tone in a more affordable package ensuring that these incredible instruments can get into anyone’s hands. Shop at Moore Music's online acoustic guitar shop today! Click Below To Get This Guitar! 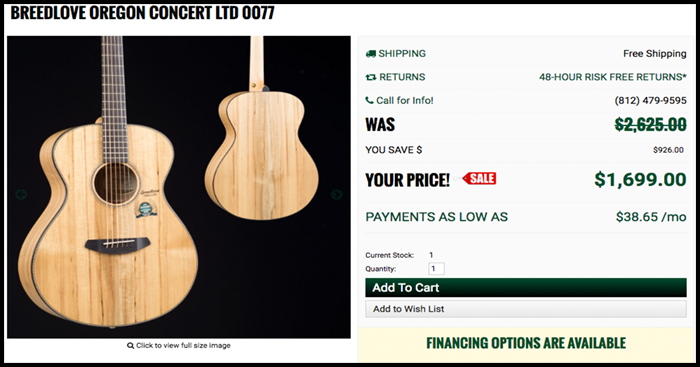 Click Here To See The Complete Line Of Breedlove Guitars!